As interventional radiology involves radiation-induced effects for the patient − and thus is regarded as a risk-prone procedure − there is a real need to assess the patient’s cumulative skin dose after each activity. Radiation Dose Monitor (RDM)‘s peak skin dose module is being scientifically validated by medical physicists from 4 hospitals of the AP-HP group in a 2-phase study. Four hospitals of the AP-HP group are currently conducting a study to validate the new feature of skin dose mapping. The RDM solution will hence be compared with experimental measurements using Gafchromic® films − first performed on anthropomorphic phantom, and then on patients in routine clinical conditions. The study is currently in Phase 1, and the first validations will be carried out during 2017. Currently in Phase 1 of the research project, meetings and work analyses have begun at the Necker Enfants-Malades Hospital. The RDM team, represented by a developer and a product specialist, visited the hospital and participated in the beginning of the study. “This first meeting marks the beginning of Phase 1 of the study and has initiated many discussions in real-time with the healthcare professionals. Sharing this experience not only allowed us to better understand the course of the study but also to promote synergy between the medical physicists and Medsquare‘s development team,” said Romain Binot, RDM product specialist. 1- Scanner calibration for reading Gafchromic films: January – February 2017. 2- Characterization and quantification of global uncertainties by Gafchromic films: March 2017. 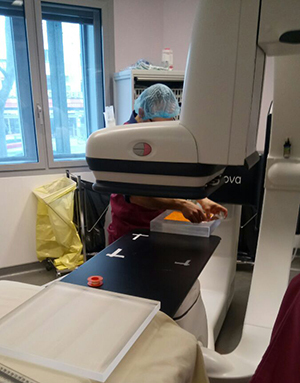 3- Validation of the incidence map with experimental measurements carried out using PMMA phantoms in a vascular GE Innova room at Necker Enfants-Malades Hospital: March 2017. Phase 1 of the project is estimated to last 3 months. A thorough analysis of the Phase 1 results will be conducted before the transition to Phase 2, which is expected to last approximately 6 months. Phase 2 will validate the algorithm of RDM’s peak skin dose module, first performed on anthropomorphic phantoms, and then on patients in routine clinical conditions. When the study is complete, it will be the subject of a scientific publication.